Blister Packaging – Valk Industries, Inc.
Blister packaging is just one of many packaging designs manufacturers use to seal their products in advance of end-user purchase; it is a very effective way of protecting a new product from damage or becoming dirty while simultaneously allowing potential buyers to examine the product thoroughly. Blister packaging is used primarily for the packaging of consumer goods in single or small quantities. Toothbrushes, small toys, drill bits, portable consumer electronics and many other products are sealed in blister packaging. Retail stores make extensive used of products sealed in blister packaging; toy stores, hardware stores, grocery stores and many other settings in which manufactured products reach end-users all depend on blister packaging. Medical products companies that manufacture and distribute medication also make extensive use of blister packaging. Especially in the case of over-the-counter medication, blister packaging is used to seal individual pills. This maintains a sterile environment for each pill and makes them easily accessible for users. Hospitals and other healthcare operations make use of disposable medical devices that are sealed in medical blister packaging, and dentists’ offices depend on blister packaging to keep anesthesia applicators free of contaminants. Blister packaging materials can be formed in a few different ways. 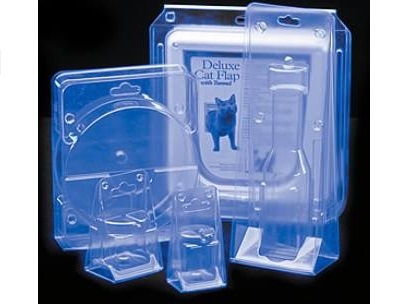 The plastic covering on a piece of blister packaging can be dome-shaped, rectangular or any other shape that is appropriate for housing a product. Blister packaging plastic can also be designed to closely fit around the contours of the product it contains. In either case, the plastic must be thermoformed (heat formed) by machinery. For domes, rectangles and other polygonal shapes, a sheet of plastic is heated to the point of pliability and then subject to a punch or a mold that gives the plastic its final shape. In the case of custom-formed plastic covers, a special mold is made that exaggerates the contours of the product to be packaged. Heated plastic is then formed against this mold, which allows the plastic to closely fit the contours of the items they seal. The backing of blister packaging can be a plastic or cardboard sheet, or, as is often the case in the packaging of snack food like gum, a thin piece of aluminum foil can be adhered to the plastic. Blister Packaging Blister packaging is a product sealing method in which a product is placed against a plastic or cardboard base and covered with a transparent plastic dome, rectangle or form fitting cover.